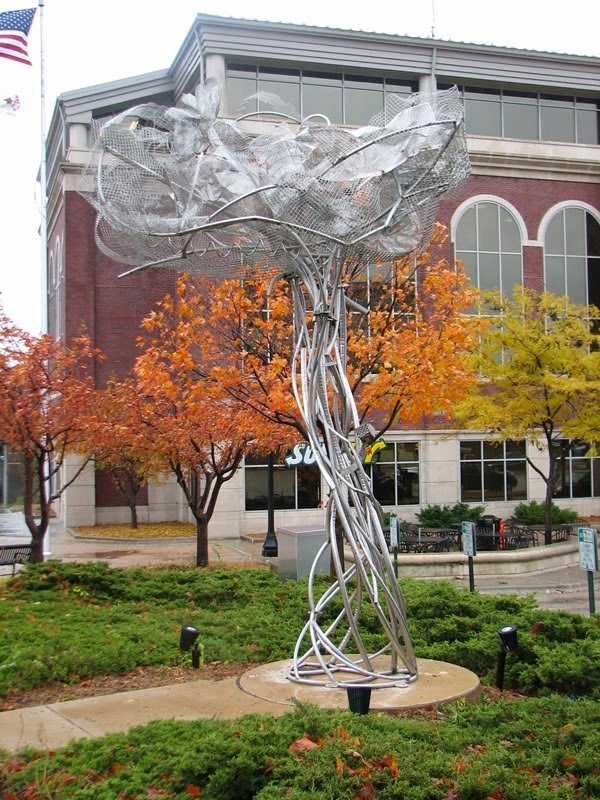 Public Art League is proud to announce the installation of Circle of Friends, a sculpture by Karen Crain, on November 6th. Public Art League worked with the City of Champaign to complete the installation at the corner of Park and Neil streets in downtown Champaign. Circle of Friends represents the 41st sculpture Public Art League has brought to the community, and its installation is possible thanks to the generous support of the Friends of PAL. Sculptor Karen Crain has been creating exhibitions for over 20 years and has won national awards in major juried shows including the National Sculpture Society, American Women Artists, and Allied Artists of America. Her works have been featured in cities and galleries across the country, and she has won People’s Choice awards in South Dakota, Arizona, and Colorado. Crain’s love of the human spirit and form are what give her art its emotional depth. Circle of Friends is a tribute to her family and the books she enjoyed with them as she was growing up. She explains, “Books can have an enormous impact on us, helping to form our beliefs, morals, and dreams. The circular shape the girl sits in echoes the theme of how books encompass our lives and become a valuable part of who we are.” The band around the outside of the circle contains the engraved titles of several books that appeal to young readers, and Crain hopes these titles will encourage young readers and their families to makes these books a part of their lives. The Public Art League is proud to announce the installation of Glory Pipes 2.0, a sculpture by the Fairfield Enterprises Public Art Collective on Friday, November 1st. 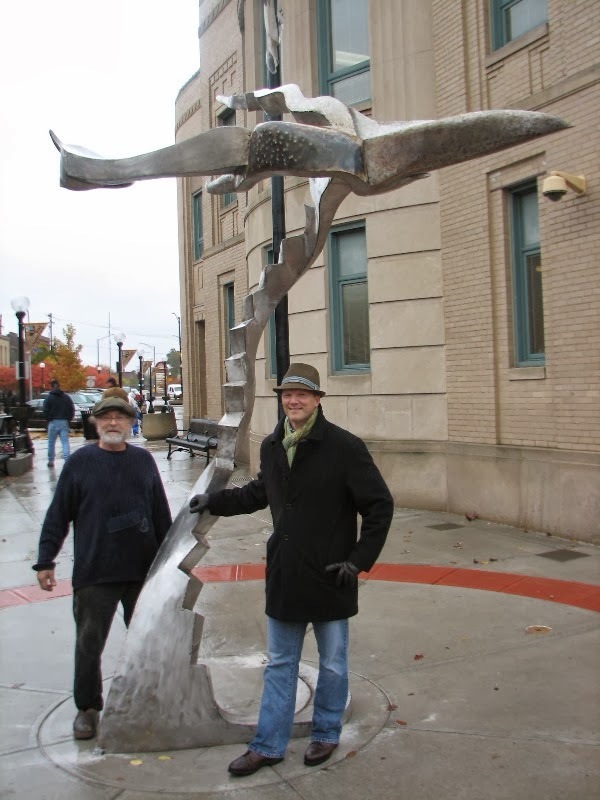 The Public Art League worked with the City of Champaign to complete the installation at the corner of Main and Chestnut streets in downtown Champaign. 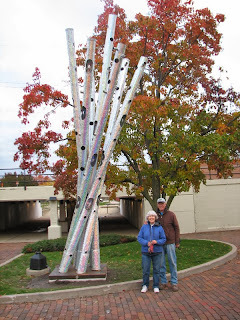 Glory Pipes 2.0 represents the 40th sculpture Public Art League has brought to the community, and its installation is possible thanks to the generous support of "The Old Depot". The designers and engineers responsible for this sculpture are part of the Fairfield Enterprises Public Art Collective, a team which strives to create contemporary yet organic sculptures that bring to the site a shining presence by day and a radiant light show by night. 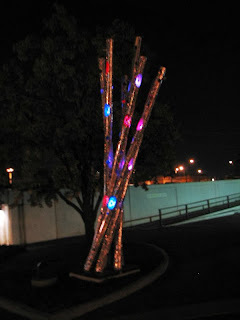 Lead by Stephen Fairfield, Ph.D., and supported by Patrick Marcus, Ph.D., E.E., and Emily Taylor, the Collective creates energy efficient, solar powered new media sculptures that utilize color, light and motion sensors incorporated in contemporary forms. Glory Pipes 2.0 contains 26 red/green/blue light emitting diodes, capable of displaying 16.4 million different color combinations. When a passive infrared sensor detects people within its range, the brightness of the LEDs increases greatly, and they change colors, patterns and frequencies more rapidly. The high activity state remains until a short time after people leave the area, at which point the program returns to a low activity state, conserving power. By moving in and out of the sensor’s detection area observers may become participants, switching the software and “playing” the sculpture’s display. The Public Art League is proud to announce the installations of It’s a Mistree and Ascend the Wind, two sculptures by Mike Helbing, on Thursday, October 31st. 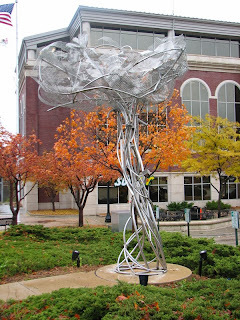 The Public Art League worked with the Champaign-Urbana Mass Transit District to install It’s a Mistree on the University Avenue side of the Illinois Terminal and the City of Champaign to install Ascend the Wind in front of the Champaign City Building on Neil Street. These sculptures, the 38th and 39th brought to the community through PAL, are possible thanks to the generous support of these two sponsors. 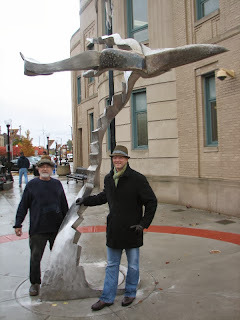 Mike Helbing’s sculptures have been featured in museums, galleries, and public spaces across the United States and in Canada. Helbing received his M.F.A. from Northern Illinois University in 1991, but long before was influenced by his tour of duty with the U.S. Army in Vietnam, of which he recalls, “War is like a crucible where elements of life are placed together and heated to incredible mental temperatures and the very assumptions and basis of existence are challenged, changed, rearranged and reconstructed.” Helbing sought to rebuild his reality through his work as an artist, and his art examines his place in the world and invites visitors to share the journey of discovery.